I would like to show you some wiring mod for the Fender Esquire guitar. It gives some different switch options than the classic construction. They can make the tone warmer or brighter in a more subtle way. The mod is based on two resistors and a 500K volume pot. The rest of parts is common. As you can see, there are two resistors, connecting switch pins with the ground (pot case). The 500K resistor will be connected to the hot line when the switch will be on the 2nd position. The 250K resistor works on the 3rd position. Both resistors can add their resistance on the connection between the hot line (red) and the ground (black). It will change the tone in the same way, as mounting potentiometers with lower value than stock. This resistance (basically impedance), by connection with the guitar pickup, will make some kind of low pass filter, which will cut-off a little bit of treble. 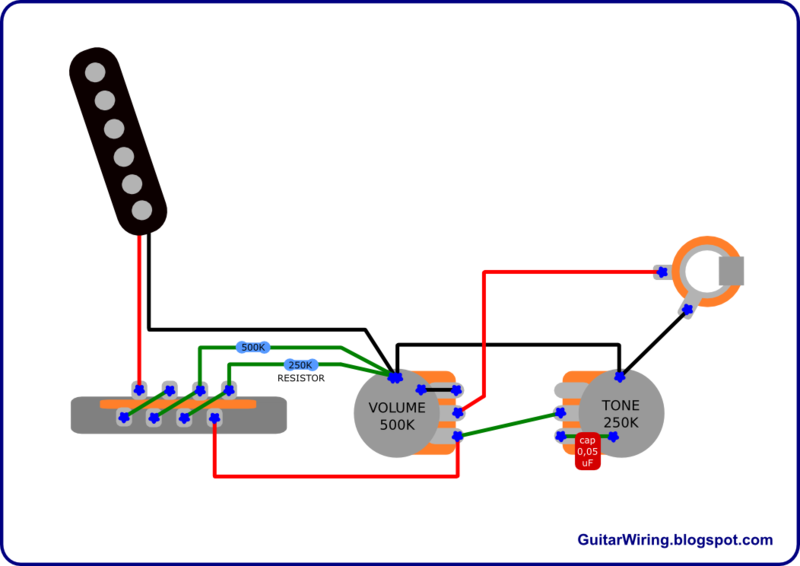 Lower value of the pot or the resistor means less treble in the signal. The 500K volume pot will make the wiring less treble bleeding. It means, that the tone will be brighter on the 1st switch position. The classic wiring has got a 250K pot in this place. The 2nd position (with the 500K resistor) will make the wiring quite common, well balanced. On the 3rd (with the 250K resistor), the tone will be warmer and smoother. You can also make some experiments with different resistor values. All these switch options, together with the classic tone control, can give a lot of flexibility to the Esquire guitar. Basically, there will be no problem with getting the right level of warmth/brightness of the tone. I recommend it for those of you, who don't like some of the Fender Esquire stock wiring switch options.